Lassie just arrived on my doorstep and my tail is wagging! Yes, mine has arrived too. Very nice package. Listening to Disc One now and the music is wonderful. Interestingly, my dog hasn't reacted at all to any of the doggie sounds on the disc, but he always sits up when he hears a dog on TV. Interestingly when I was playing a few clips here at my sister's home and her dogs heard Lassie, they answered back, but then one is a Collie who looks like Lassie, the other is an honorary Collie because as a service dog he has attended many Collie Club meetings with my sister (He is a Dalmatian). They both speak fluent Collie. could someone give a review about the music and the sound effects ? I'm watching the Lassie movies this week and I got a real chuckle. In COURAGE OF LASSIE, Lassie portrats a dog named "Bill". So you have a male dog playing a female dog playing a male dog. Hmmm. This is decades before TOOTSIE! The music sounds great. I'm being sueded towards a purchase. When will the PDF notes be available? 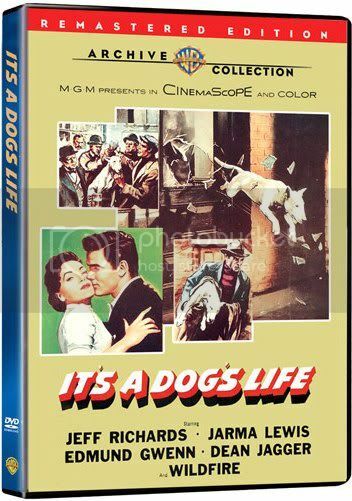 "It's a Dog's Life," score by Elmer Bernstein, has been issued as a made-on-demand DVD by Warner Archive.